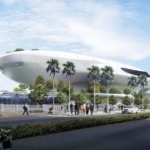 MAD Architects and the Lucas Museum of Narrative Art have unveiled a trio of new renderings for the $1 billion project in advance of a formal groundbreaking ceremony taking place in Los Angeles’s Exposition Park this morning. The renderings come as work on the spaceship-like structure is set to begin in earnest, capping off over a decade of uncertainty for the Lucas Museum following high-profile public battles between the budding institution and several potential host cities, including San Francisco and Chicago. The proposed museum was redesigned several times over the course of these battles before a dual-lobed, elevated structure pitched to Los Angeles was accepted there late last year. 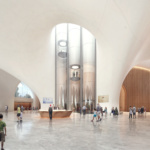 The 300,000-square-foot complex is due to rise roughly 115 feet high and will be divided into two main masses along the ground and first floors, with the levels above connected to create continuous gallery spaces. The bulbous museum complex will be located atop former parking lots that will give way to 11-acres of new parklands designed by Mia Lehrer+Associates (MLA). The building itself will be topped by two-acres of landscaped areas in an effort to add even more greenery to the site. Despite the fact that the new museum will be located beside multiple transit stops, the complex will contain a whopping 2,425 parking stalls located in a subterranean garage. 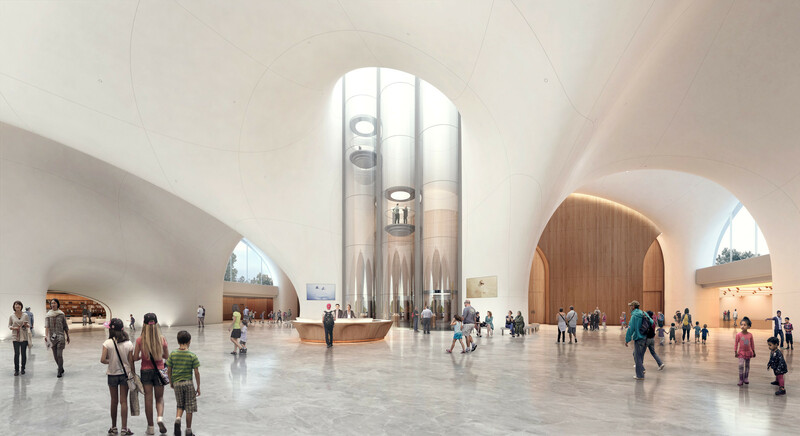 Renderings for the complex depict new views of the building’s lobby areas showing vaulted waiting and ticketing areas flanked by glass tube elevators. A new rendering for the building exterior shows a more streamlined massing for the structure, while a new view of MLA’s work depicts walkways and seating areas bordered by expanses of scrubby bushes and tall deciduous trees. The structure is expected to be complete by 2021.